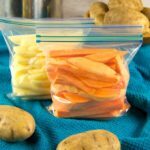 Whether you grow your own potatoes, purchase in bulk from the farmers’ market, or snag a great deal at the supermarket, a day of prep can fill your freezer full of potato French fries ready to bake or air fry quickly for meals. Potatoes have been relied on for centuries as a great crop for winter food storage. However, there may be times when storage conditions are not ideal. 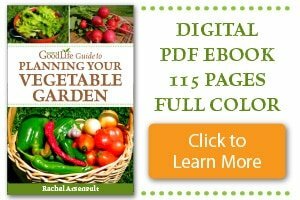 Maybe you don’t have a cold basement for storing root crops, or perhaps your winter ends up warmer than expected and your potatoes are beginning to sprout and soften in storage. Don’t let your storage potatoes go to waste. Another way to preserve homegrown potatoes is to freeze potato French fries. Preparing and freezing French fries also cuts down the cooking time allowing you to bake or air fry French fries in half the time as making from scratch. Select mature, high-starch, baking type potatoes that have been cured and stored for about a month. Starchy potatoes that have been cured are low in moisture and high in starch. The longer potatoes are in storage, the more the starches convert to sugar. Too much sugar will result in soggy dark-colored fries. These are still tasty and safe to eat, just not as crispy. Good starchy potatoes for freezing for French fries include Russet, Idaho, and sweet potatoes. 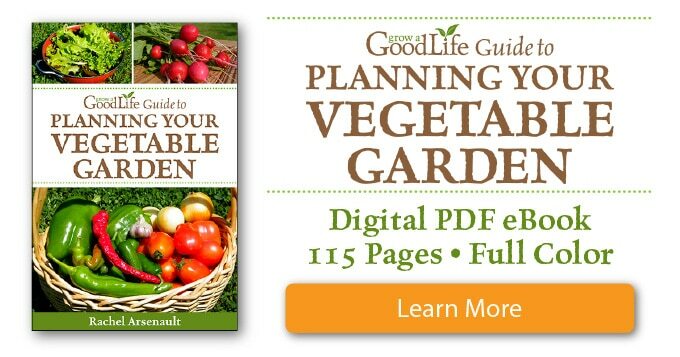 Additionally, consider trying all-purpose potatoes, such as Green Mountain, Yukon Gold, and Kennebec. These contain enough starch to hold up well when blanched and frozen without turning mushy. New, thin skinned, freshly harvested potatoes, waxy, and boiling type potatoes such as, Red Norland, white round, fingerling, and colored tubers tend to come out a bit soggy when frozen due to the moisture and sugar content in the tubers. If cold storing these types of potatoes isn’t for you consider canning these potatoes for food storage instead. Kitchen equipment needed to prepare your fries for the freezer include a large pot, two large bowls, knife, cutting board, vegetable peeler, slotted spoon, sheet trays, parchment paper, kitchen towels, and quart sized freezer zipper bags. If you have a lot of potatoes to cut into fries, you can save lots of time by using a fry cutter like this one. Scrub your potatoes under running water and pat dry with a kitchen towel. The peeling can harbor botulism bacteria, so to be on the safe side, it is best to peel potatoes that you will be preserving. As you peel, trim off eyes, scabs, bruises, and green spots. Then rinse the potatoes well under cool water and pat dry with a clean kitchen towel. Use a knife to cut the potatoes into 1/2-inch fry shapes. As you work, place the cut potatoes in a large bowl of cold water to keep them from turning grey and to rinse off the excess starch and surface sugars. Pre-cook your French fries by blanching in boiling water and then dropping into a bowl of ice water to stop the cooking process. Blanching partially cooks the potatoes to slow the enzymes that cause lost flavor, color and texture. To blanch your potatoes, bring a large pot of water to a boil over high heat. While the pot is heating up, fill a large bowl with cold water and ice. Drop your cut potatoes into the boiling water and boil for 5-minutes. Remove the fries and plunge into your bowl of ice water to cool. Once the potatoes are cool, remove them from the ice water and dry well with a clean kitchen towel. First, freeze the fries in a single layer on a sheet pan so they don’t stick together. If you have a lot of fries to freeze at a time, use a sheet of parchment paper in between layers and keep piling the fries on. Place in the freezer for about an hour until they are frozen. 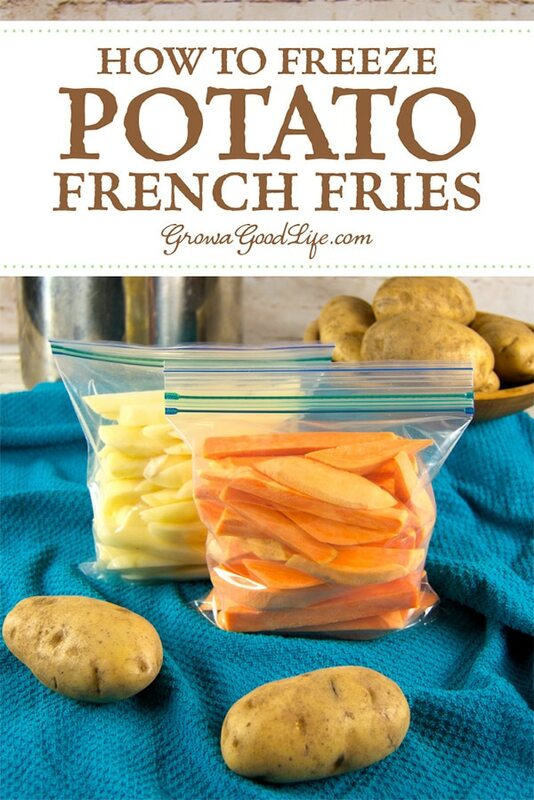 Pack the frozen fries into freezer bags. About two pounds of fries will fit into a quart sized freezer bag. Remove air from the bag, seal, label, date, and store in the freezer for up to 3 months. Keep your French fries frozen until you are ready to use them. Do not thaw before cooking or the fries will turn brown. You can cook your fries in various ways, including baking and air frying. To bake the frozen fries: Preheat your oven to 450°F. Spray a sheet pan with avocado oil spray, spread out the frozen French fries, spray with more avocado oil, and bake in a preheated oven until brown and crispy, about 12-15 minutes. Turn about half way through. Season and serve warm. Whether you grow your own potatoes, purchase in bulk from the farmer' market, or snag a great deal at the supermarket, a day of prep can fill your freezer full of potato French fries ready to bake or air fry quickly for meals. Scrub your potatoes, peel, rinse well, and pat dry with a kitchen towel. Cut the potatoes into 1/2-inch French fry shapes. Place the cut potatoes in the bowl of cold water as you work. Bring a large pot of water to a boil over high heat. While the pot is heating up, fill a large bowl with cold water and ice. Working in batches, blanch your fries by dropping them into the boiling water. Boil each batch for 5-minutes. Remove the blanched fries and drop them into the ice water. Let cool for at least 15-minutes. Remove and dry well with a clean kitchen towel. Lay out on a parchment lined sheet pan and freeze. 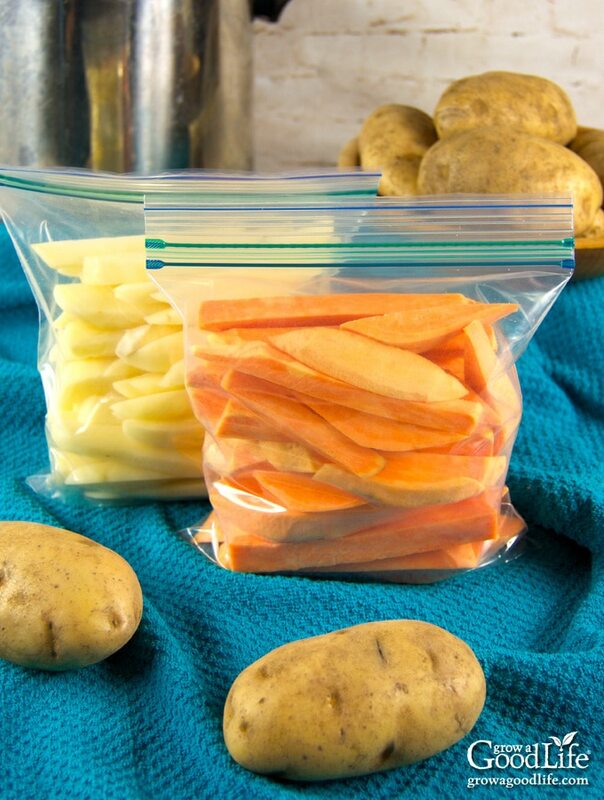 Store frozen fries in a zipper bag for up to 3 months. 2 pounds of potatoes fits into a quart sized bag. Spray a sheet pan with avocado oil. 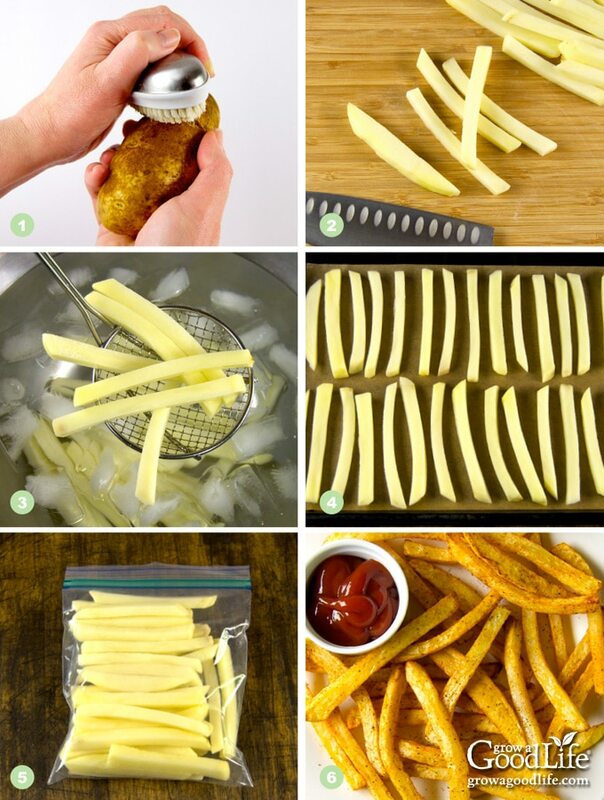 Spread out the frozen French fries on sheet pan, spray with more avocado oil, and bake in a preheated oven until brown and crispy, about 12-15 minutes. Turn about half way through. Season French fries and serve warm. I have always been bummed that potatoes could not be successfully frozen. I will give this a try since oven baked sweet potato fries are a big hit at our house! We are still trying different kinds. Do you have a favorite sweet potato you grow? I don’t grow sweet potatoes enough. I did have good results with Beauregard sweet potato, but I really need to explore others. Sweet potato fries are a treat! Awesome post, Rachel! I had never thought to do this, but it’s on my list of things to try. Hello Margaret! So good to hear from you! I hope you give this a try.